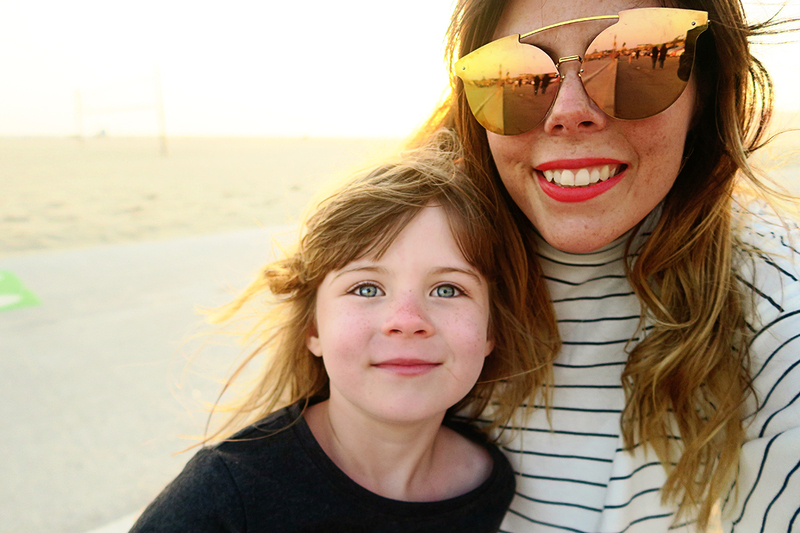 I am finally back writing about our California road trip. We arrived back from our trip and I was so raring and ready to write it all up, I wrote a few posts and videos which took me hours upon hours to do and then I suddenly got wrapped up in moving house and basically our California trip got put to the back of the list of things I needed to write about. However I have had so many messages from people asking me whether I will continue writing the posts so I am back doing one today. I have still got a few more to do, plus the final video too, but I want to make sure I document it as it was the most incredible trip ever. 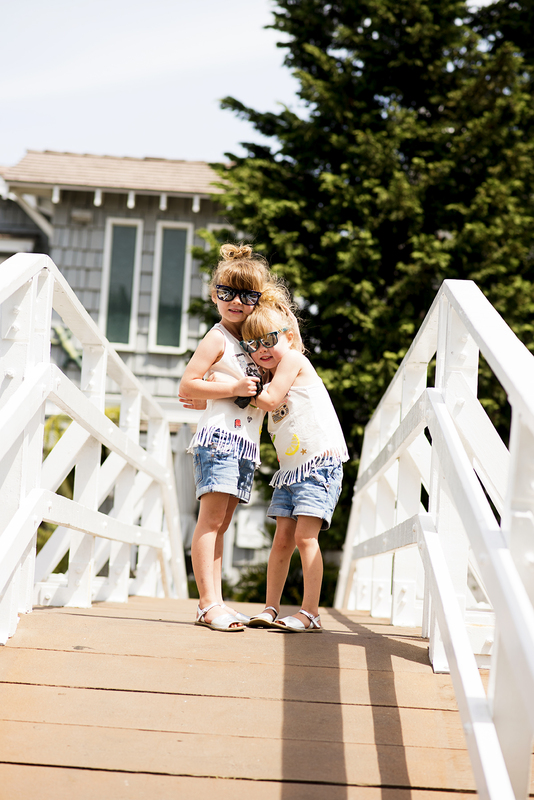 We decided to stay three nights in Marina Del Rey and use it as a base for exploring LA and the surrounding areas. 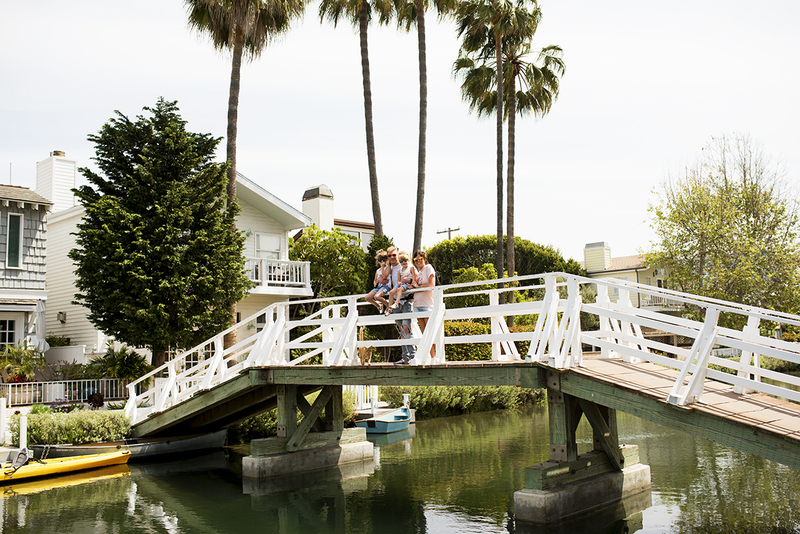 Marina Del Rey is less than half an hour away from Hollywood but on the coast, with Santa Monica within walking distance. We couldn’t decide before we went whether to stay in LA centre or not and I am really glad in hindsight that we made the decision not to. While LA is probably the coolest and most instagramable and colourful city I have ever been to, I can’t put my finger on it, but it isn’t my most favourite place we have ever been. 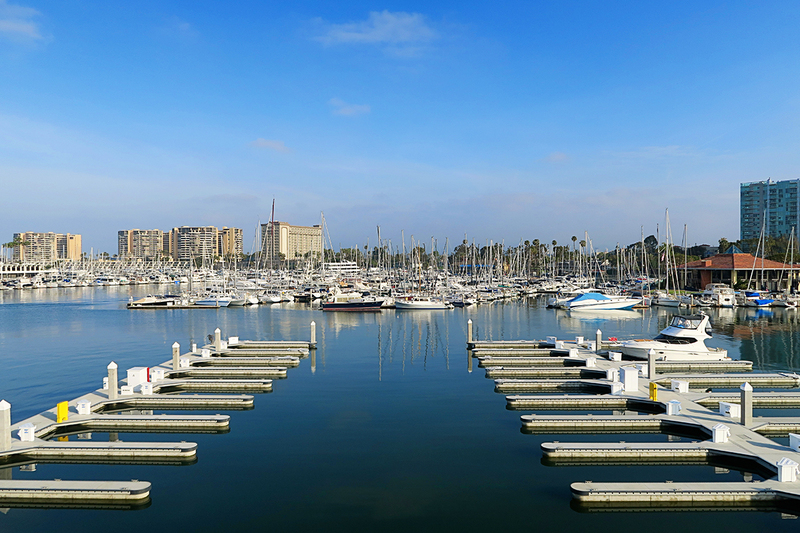 Staying in the quieter Marina Del Rey area was perfect for us. 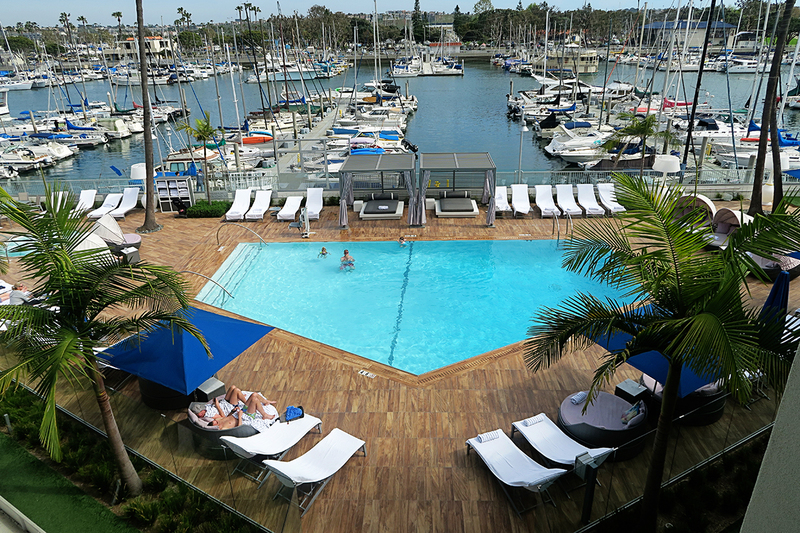 We stayed in the Marina Del Rey Hotel and it was lovely, we had a huge corner suite with views overlooking the Marina. We used a mixture of budget hotels on our stay and slightly nicer ones and this was probably the nicest one we stayed in the entire trip. It had a lovely pool as well which the children loved spending the afternoon in one day. 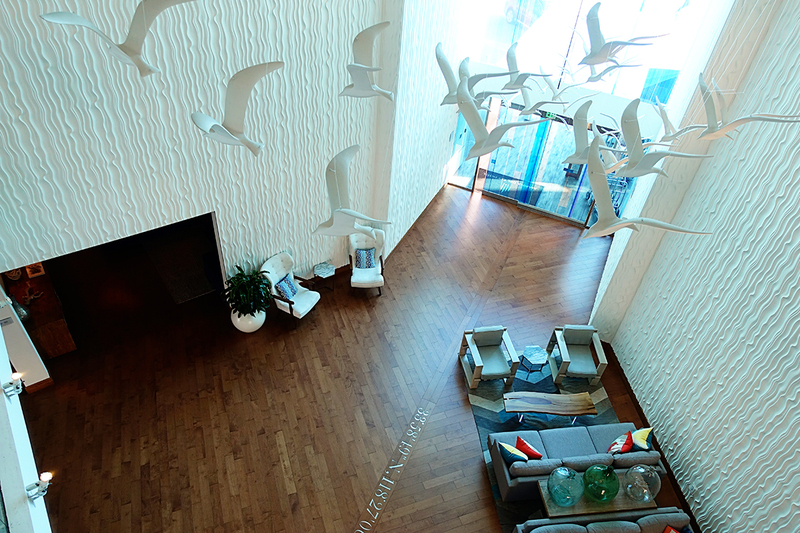 I also loved the reception area with the birds as well. Our first afternoon in LA was mainly spent driving about. In actual fact almost the entirety of our time in LA was spent driving about. I had heard about the traffic beforehand but they certainly aren’t wrong. The traffic is an absolute nightmare so prepare to spend a fair bit of time stuck in queues. There is also no real centre in LA so a lot of our time was spent driving from place to place as you can’t really walk anywhere. We spent a lot of time driving about and taking it all in. The first afternoon we spent most of the time in the car driving around a few different places I wanted to go to take photos. This doesn’t sound like much fun for the children but in actual fact it was a welcome break for them, they were all tired and spent most of the timing snoozing and playing on the iPad. A lot of people have asked us what it was like taking three young children on such a long road trip, but we found it to be one of the best holidays we have done. It was both busy and relaxed and the downtime in the car from place to place really helped us all recharge our batteries. 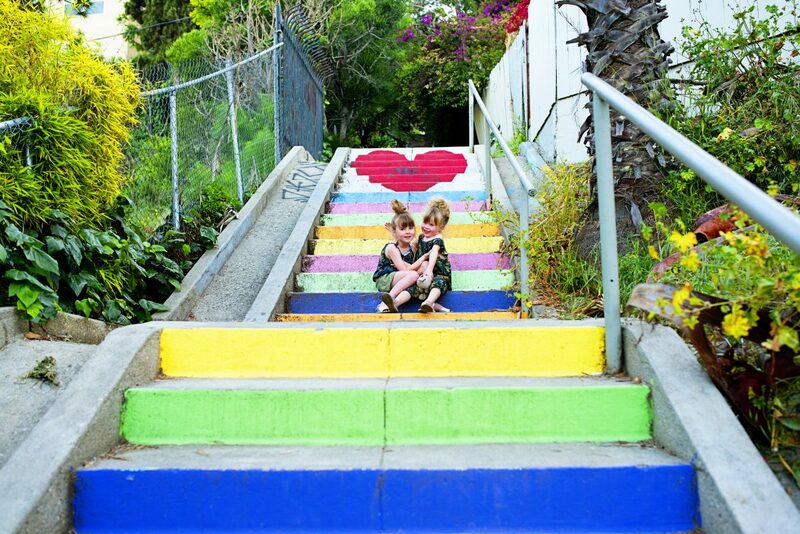 The first place we drove to on our photo taking LA afternoon was the Micheltorena Stairs. I had seen these beautiful colourful stairs on instagram and I just knew I had to seek them out. Located at Micheltorena St. & Sunset Blvd for those of you wanting to take a drive to them, the area they are in is called Silverlake which is a real cool suburb of Los Angeles, where apparently the young and hip creatives hang out. There are lots of cool independent coffee shops and bars, plus other general places to be seen. 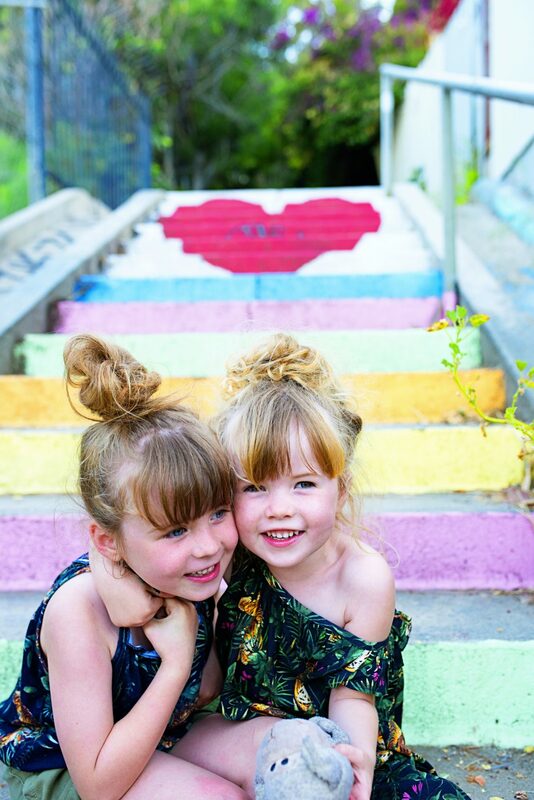 I think the above photo of my girls is one of my favourites I have ever taken. We also spotted this wall while we were there too. I looked it up and it was painted by Dallas Clayton, and it became quite famous when a while ago a story was all over the news about a girl who stood next to it posing for instagram while a homeless man slept by her feet. People argued that it showed the disparity between the ‘haves’ and ‘have nots’. Indeed we were quite shocked and saddened by the terrible amount of homeless people throughout the city and it was quite sobering at times. LA has been unfortunately named ‘the homeless capital of America’ and it was clear to see that it is a real issue in the city. Then it was on to another wall, this time one outside the Chinese Laundry footwear HQ, situated on 3486 La Cienega Blvd in Culver City. It’s so funny to visit these places as you think you are a total fruitcake for driving somewhere especially to find a wall, but then you pull up and find that loads of other people are doing the same thing. In LA it is definitely all about the walls. I love this photo of Mads jumping. After this we headed to the rather glitzy suburb of Beverly Hills to get our Pretty Woman on and walk Rodeo Drive. I grew up loving Pretty Woman and while Rodeo Drive was entirely similar to what I expected, it also wasn’t anything hugely special. Jon loved seeing the famous Bugatti car, belonging to the late designer Bijan Pakzad. When the designer died they decided to leave his car there and it proves quite the photo opportunity for people who are in to cars, like my husband. 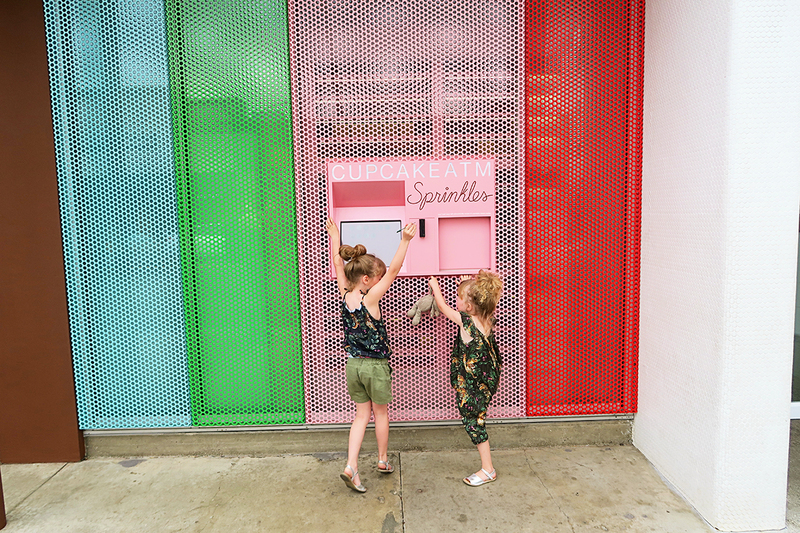 We also headed for a Sprinkles cupcake from one of their famous ATM machines, we did this in Disney Springs in Orlando and the girls were so excited to find there was one here as well. After this we went back to our hotel, ordered in pizza and had an early night, ready for the next day. After a busy few days we decided that Thursday would be a day to just relax and chill, with no real plans. 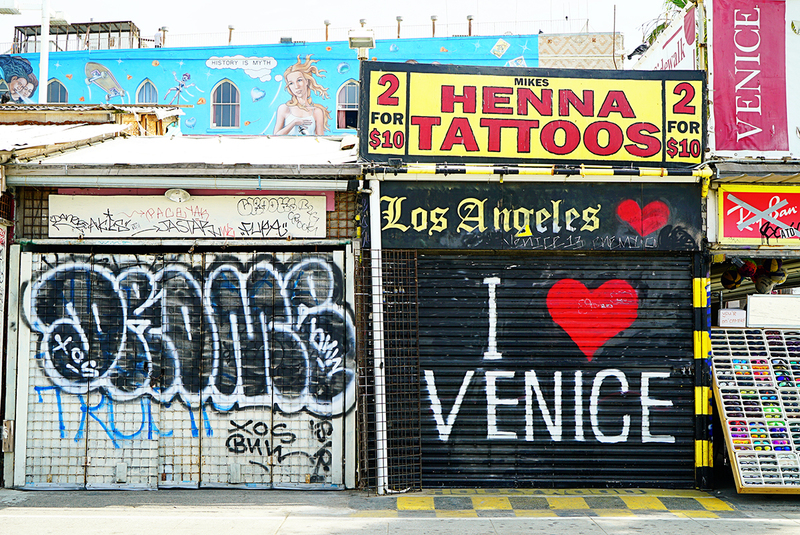 We decided first thing in the morning to make the half an hour or so walk from our hotel to Venice Beach. 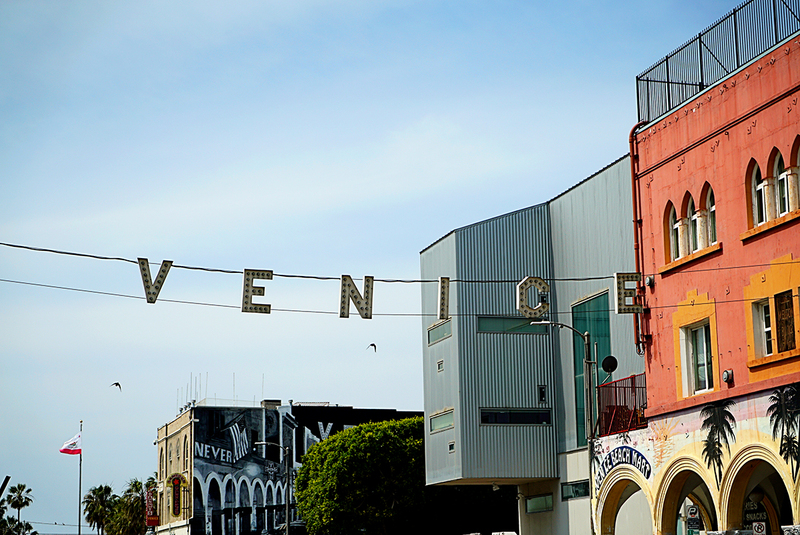 I am sure you have heard of Venice Beach but it is a rather famous area, home to Ocean Front Walk, which is often described as a modern day freak show, with circus entertainers, mystics, stalls and of course Muscle Beach too. However Venice is also home to some beautiful canals, much like it’s name sake in Italy. 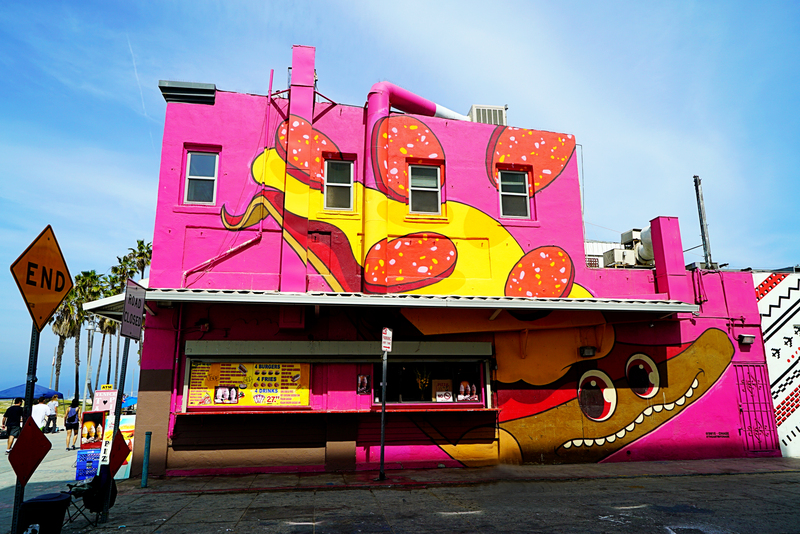 Can I paint our house like a pizza? 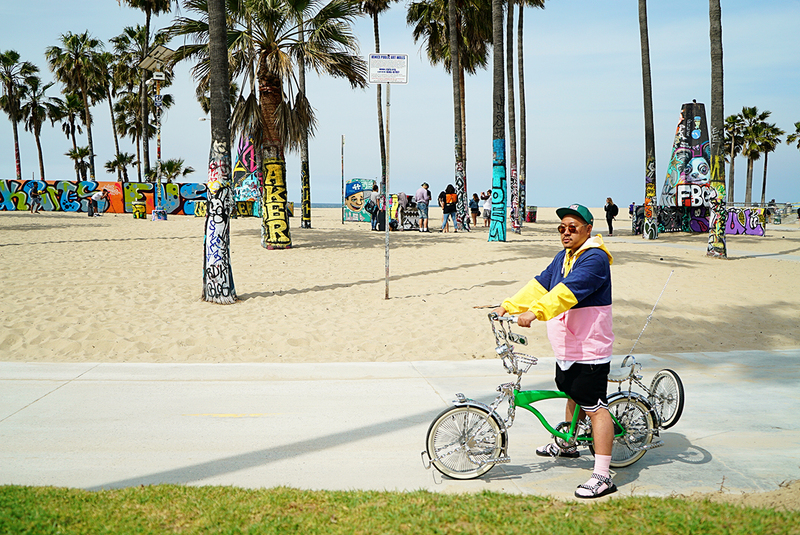 It was really cool watching the weird and wonderful people of Venice Beach, I could have sat and people watched for hours. 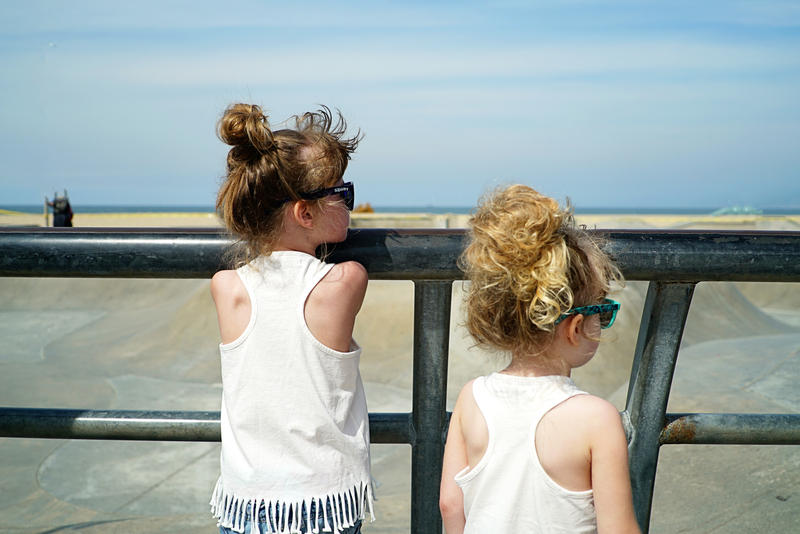 The girls loved watching the skate boarders, they drew a huge fan club of people stood watching them. Like I said before, Venice does have a side away from the crazy and weird, you literally just walk down a side road and you are faced with the beautiful canals area, where there are absolutely stunning houses and it is so quiet. It is hard to believe it is the same place. We spent most of the morning and early afternoon in Venice just soaking up the atmosphere, before walking back into Marina Del Rey and heading to one of our favourites ‘The Cheesecake Factory for an early dinner/late lunch. Whenever we are in America we try and eat there as the food is delicious and the girls love it too. 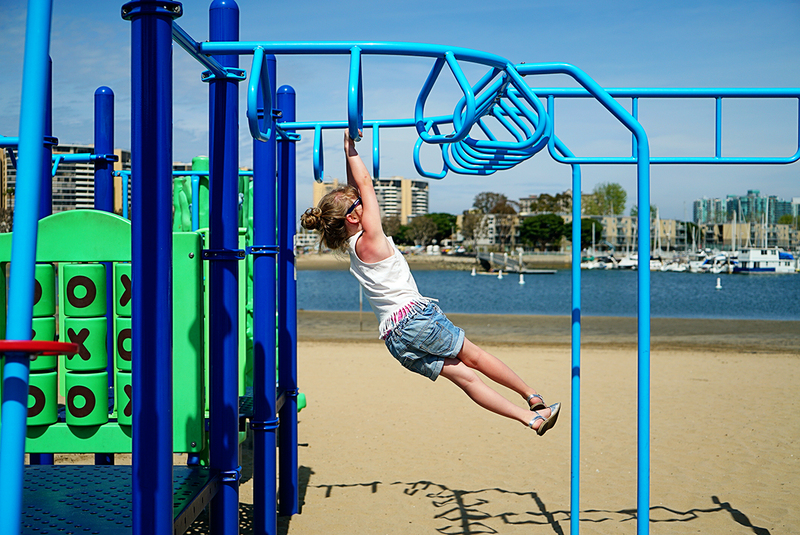 There was a playground on the beach just outside so we stopped and played there for a bit before heading back to the hotel pool for the rest of the afternoon. Two little bronzed crazy ladies having a joke on our balcony. Friday bought our first (and only venture into Hollywood). 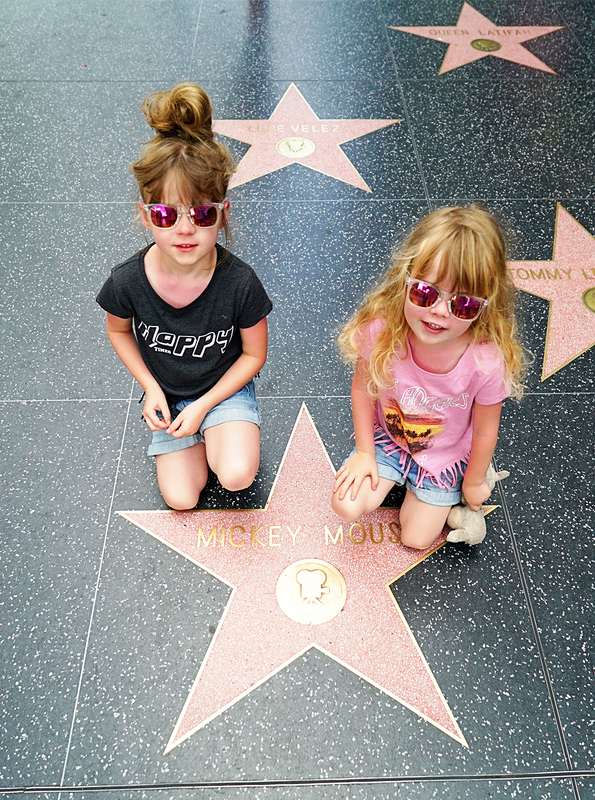 I had wanted to go to Hollywood ever since I was little. 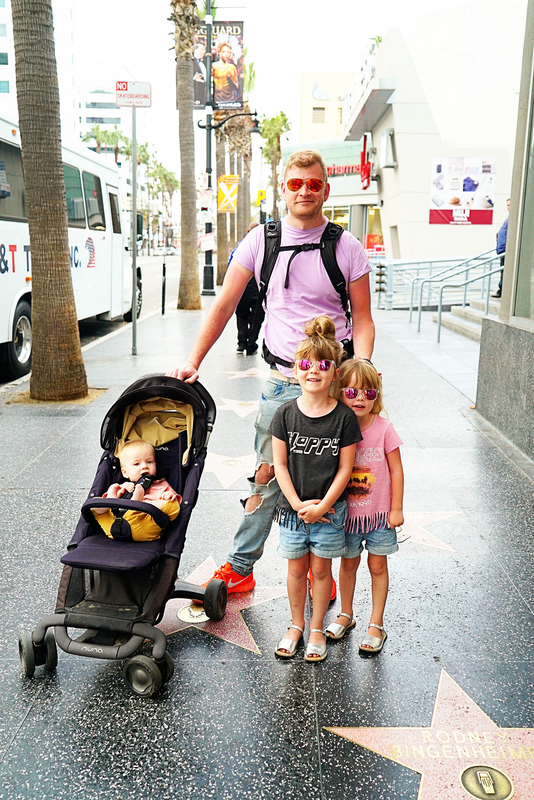 We decided to head straight to the Hollywood Walk of Fame. The first problem however was finding it. I don’t know what I was expecting but I sort of thought that there would be a beginning and an end. We drove around and around in circles with the sat nav (and us!) getting more and more confused. Eventually we parked up and decided to walk to find it, and we stepped out of the car park and there it was. In all honesty it was a bit of an anti climax, just a busy road with stars on the pavement and lots of people trying to sell you things. Still we stuck it out, after all we were in Hollywood baby, and we walked up and down the stretch looking for names we recognised. Don’t get me wrong if you are in Hollywood it is worth a visit just to say you have been, but it isn’t anything particularly special. 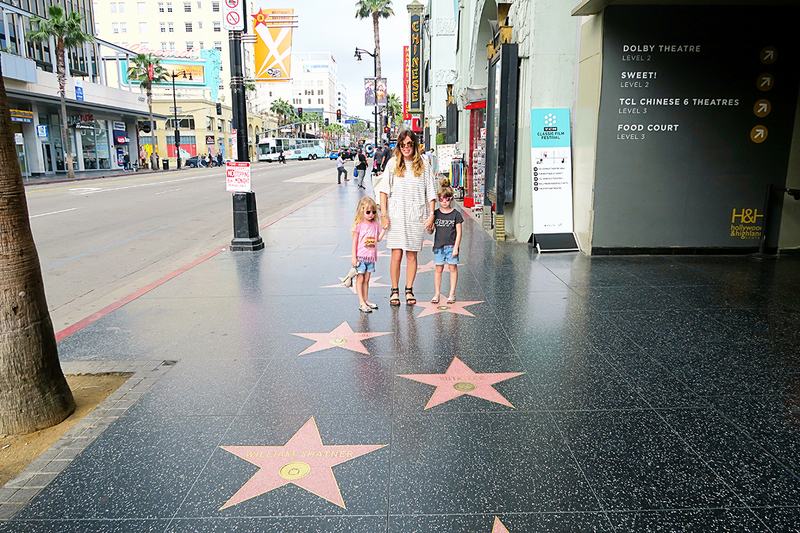 We wandered around Hollywood for a bit longer, but in all honesty I can’t say I was over enthusiastic about any of it (it was a little seedy in parts and just full of tourists- like us!) 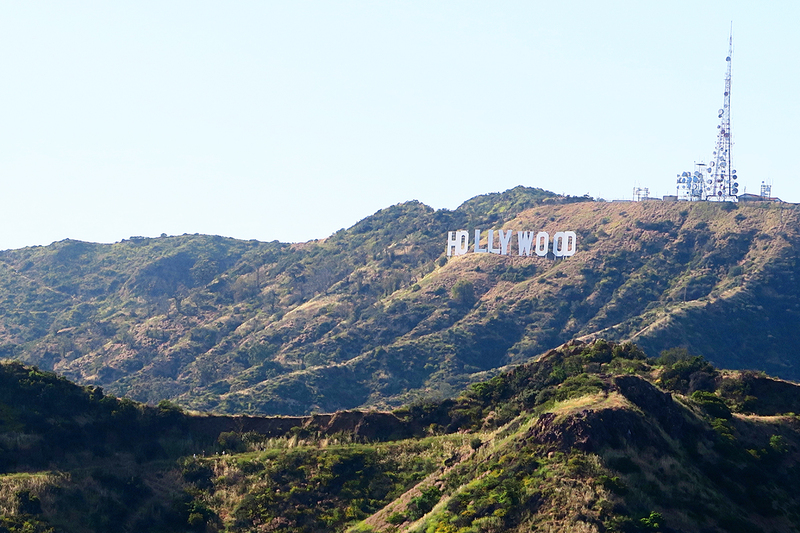 There’s a mall just nearby called Hollywood and Highland and if you walk to the back of it you get a clear view (albeit far away) of the Hollywood sign, so that is worth a look. After our brief stint in Hollywood we firstly headed to lunch at IHOP (we cannot go to the US without at least visiting IHOP twice) and then it was time for a bit of instagram tomfoolery. 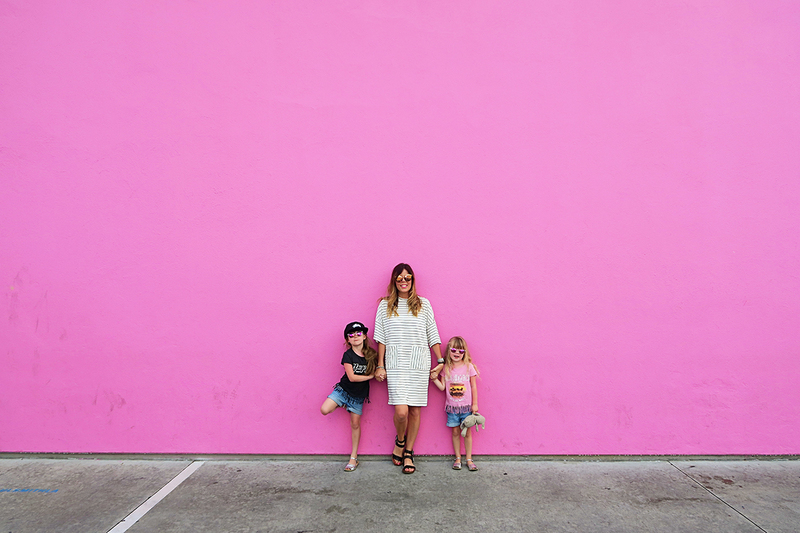 I had seen so many people post photos of the ‘famous Paul Smith pink wall’ (so famous it has its own instagram account) so I made my long suffering family go and drive to find it. The wall is so famous it even has its own sign of rules next to it, basically it is just the flagship store of the designer Paul Smith but for some reason it has become the place for many an insta blogger to hang out. Indeed we got there and Jon nearly fell about laughing- the place was FULL of people taking photos. There were fashion bloggers strutting their stuff and posing with full on film crews, there were young girls getting irate at their mums for not taking their photo properly, groups of girls all taking photos of each other, and even the odd instagram boyfriend snapping photos of their girlfriend for their next blog post. It was honestly a crazy place and Jon said it was an example of all that was wrong with the world of social media. But that didn’t stop me making him take photos of us. 😉 There is a bit of etiquette there, people generally let you have a couple of minutes to take a photo and then it would be their turn. 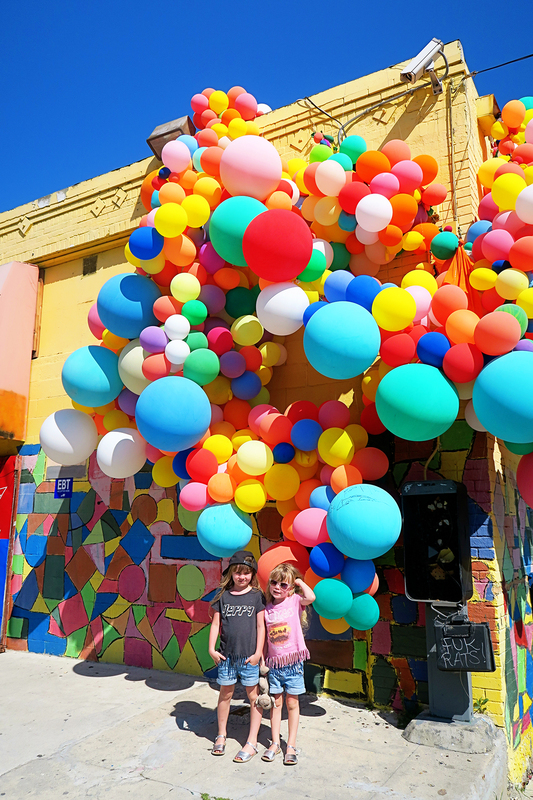 If you are ever going to LA and want to check out this crazy place it is situated on 8221 Melrose Avenue, West Hollywood. 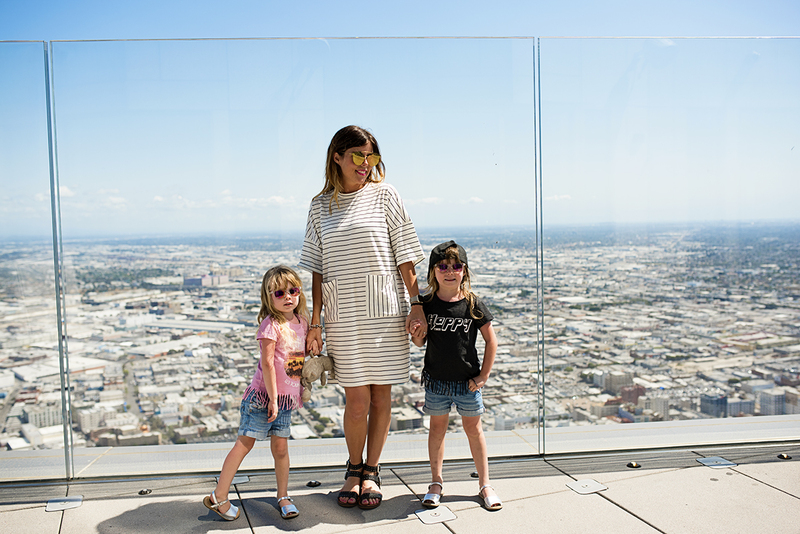 After getting our pose on we decided to head to the US Bank Tower to head up to California’s tallest open air observation deck- OUE Skyspace. 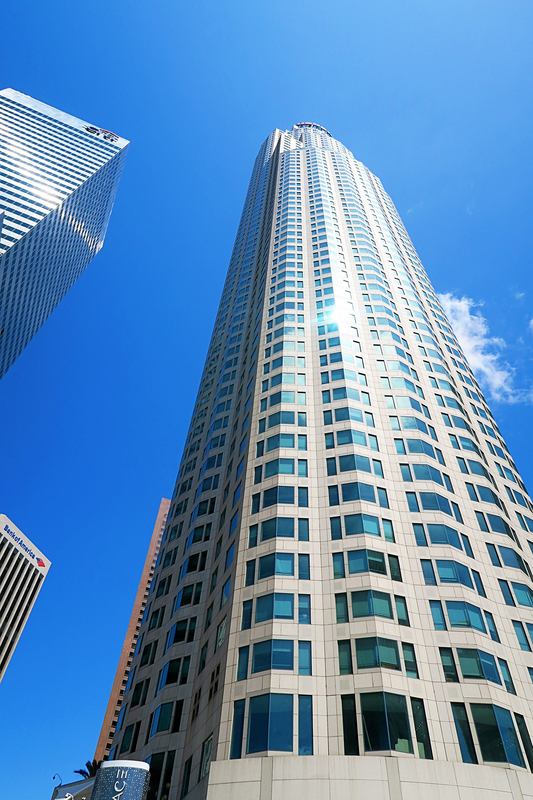 Situated in the financial district this tower boasts amazing views all over LA, the observation deck is relatively new but I had seen it on the Visit California instagram page which I was obsessively stalking before we went. 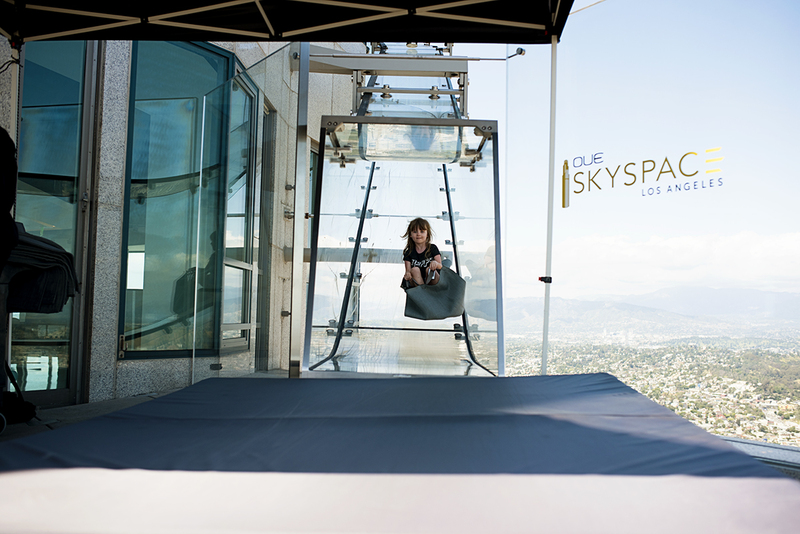 The thing that made me want to go there was that they have the SkySlide- the world’s first perspex slide where you literally slide down the side of a building. Mads and I were the only daredevils in the family to go on it, Jon’s excuse was that he ‘was looking after the children!’ It was so much fun, you have to pay a bit extra on top of your ticket to ride the slide but it is 100% worth it. The tickets in all honesty are quite expensive but it is definitely a fun thing to do as a family. We took lots of photos up there before it was time to head to our next destination. We had planned to go to Griffith Park and head to the observatory for some cool views of the Hollywood sign and LA, but on our way we passed this! 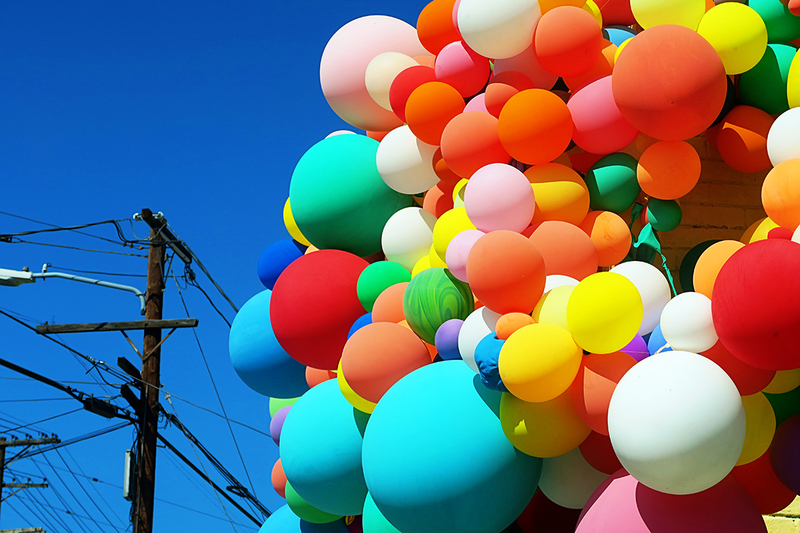 This beauty was a temporary pop up work of art by Geronimo Balloons who creates beautiful public art installations of her balloons. The photos don’t do justice how amazing it was, it was huge and colourful and gorgeous. There was already the LA blogger crowd there again taking photos as we happened to drive by (I told you LA is a crazy place!) and we couldn’t help but stop ourselves. I went into the little shop to buy a drink and the guy whose business it was served me- he said that it had done wonders for his trade! 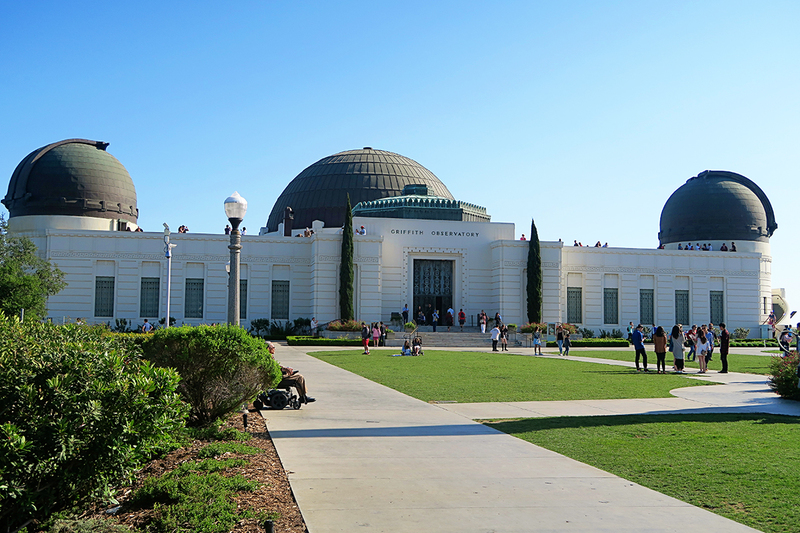 We then headed up to Griffith Park to try and take a few photos. It was probably around 4pm by this point and what we didn’t envisage was having to queue to get into the park even at that time. But soon we were there and as it was absolutely packed we decided I would literally jump out the car and take a quick photo and then we would head somewhere else. 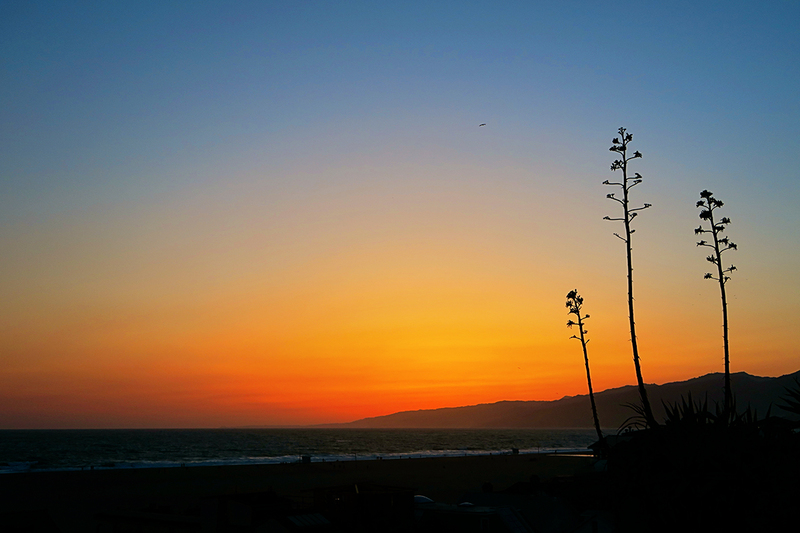 We ended the day in Santa Monica where all of a sudden it got unbelievably windy. We went down to the beach and watched the sunset and it was absolutely beautiful. We were going to head to Santa Monica pier, but by this point we were all exceptionally tired, (plus we had already been to a pier in Santa Monica) so we stayed there until the sun had completely set before heading back to our hotel. 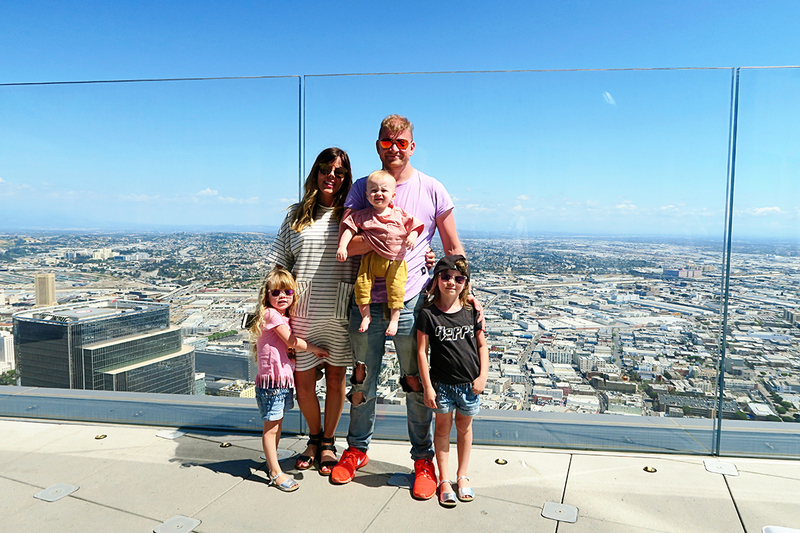 Overall we really enjoyed our time in LA. It was very different to how I expected, and there were some parts, like Hollywood, that were just a bit hyped up. 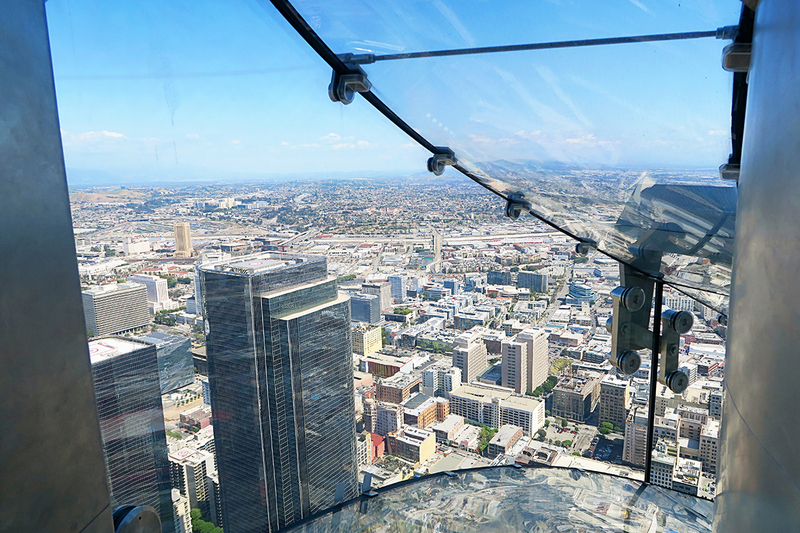 Like I mentioned above we spent a lot of time in the car as LA doesn’t really have a centre point, but this wasn’t necessarily a bad thing as it meant we got to really explore the city and we also gave the children some well needed down time. Would we go back to LA again? 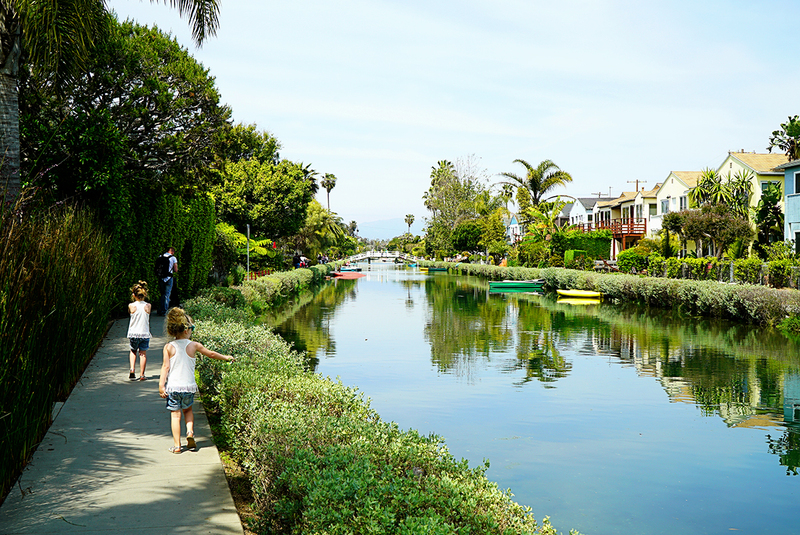 Definitely but we would make sure we stayed in the Marina Del Rey area again- we felt this was the perfect area as it was quiet for families but close enough to walk to Venice Beach and Santa Monica, while also being near enough to drive into LA centre. 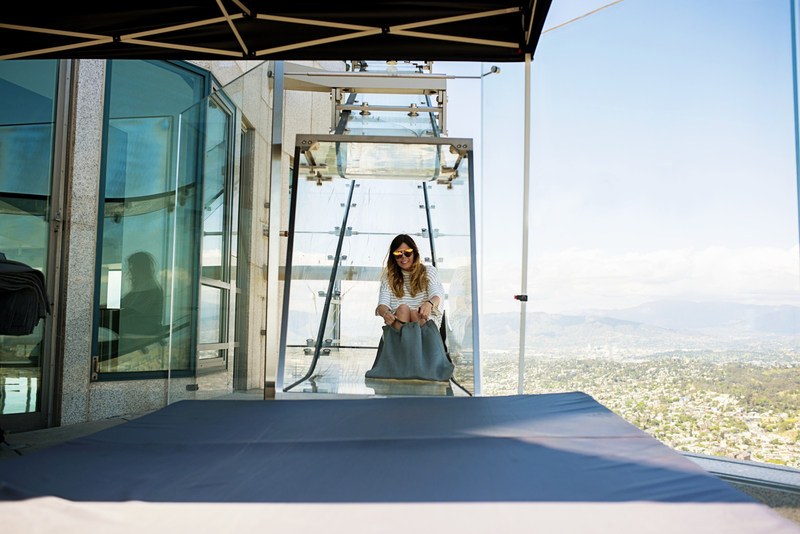 LA certainly wasn’t my favourite place on our trip, but we still had a great time, and I can now say I have ticked it off my bucket list! 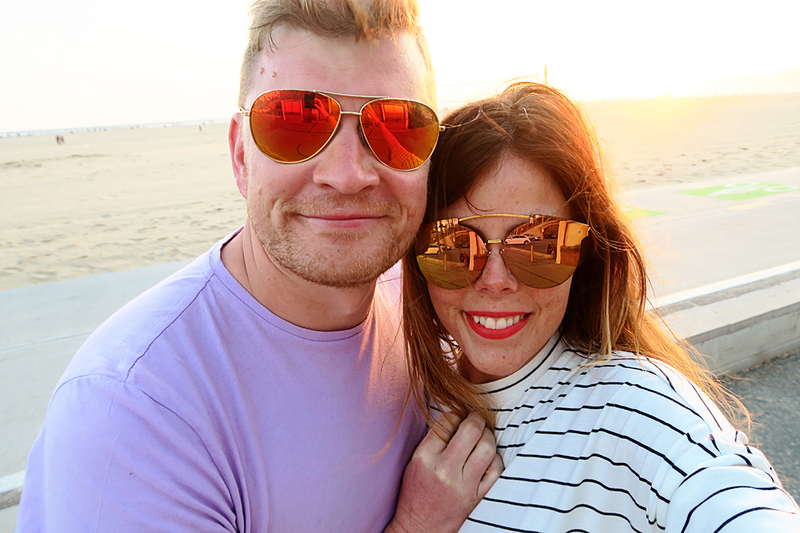 Here is a video I made of our time in LA (and also Newport Beach which I will talk about next time). 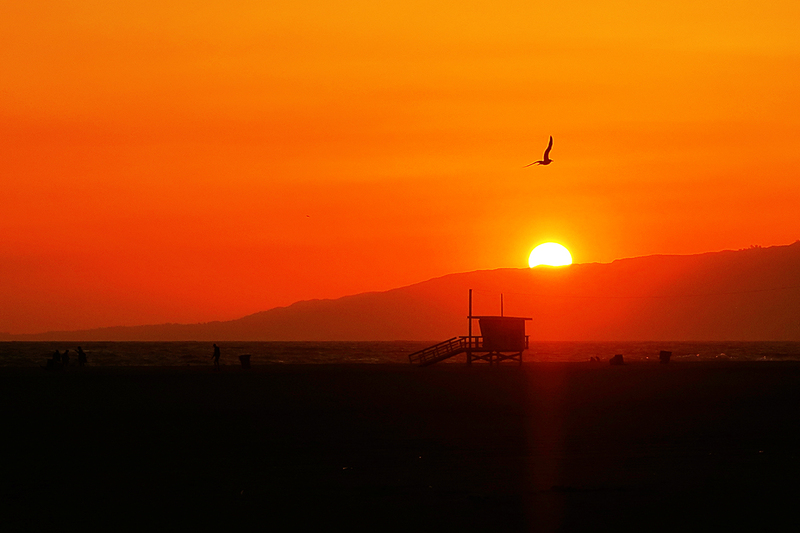 To check out some more inspiration for travelling to California, check out Visit California. Thanks to them for helping us plan our trip. STUNNING photos and beautiful description of your trip, which sounded so fun! 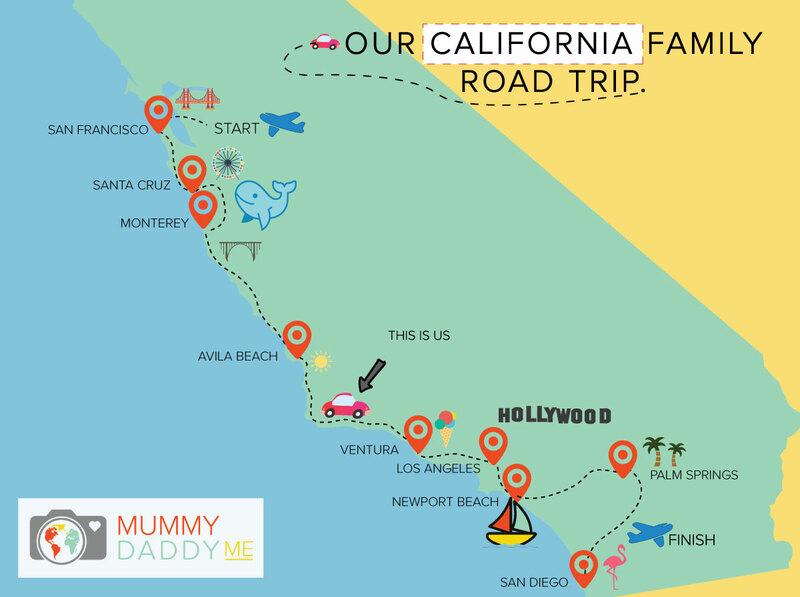 I’ve never considered taking the four on a road trip, but you’re definitely making these kind of adventures seem far more achievable (not to mention enjoyable) with a young family. I found the numbers of homeless people (many of whom clearly suffering from mental health issues as well) really sobering, too. Made me appreciate the social care system that we have here, and the NHS. 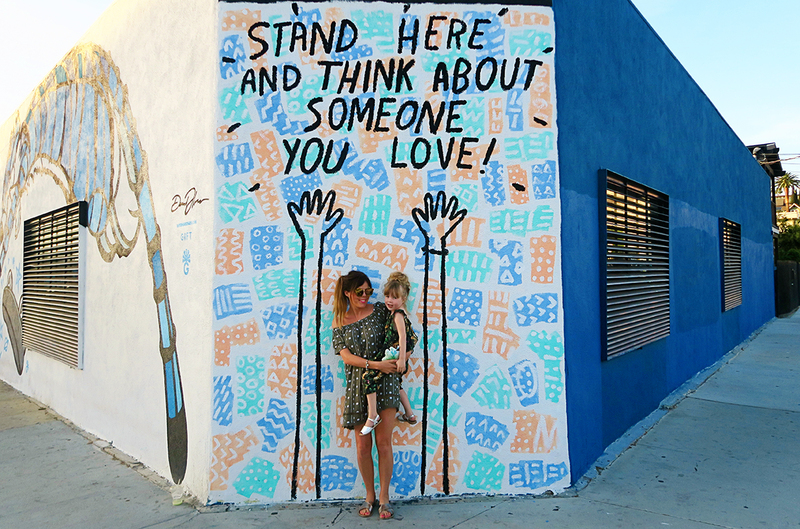 Such fun photos in this post, I love all the street art and the colourful walls. Wonderful photos and amazing places. 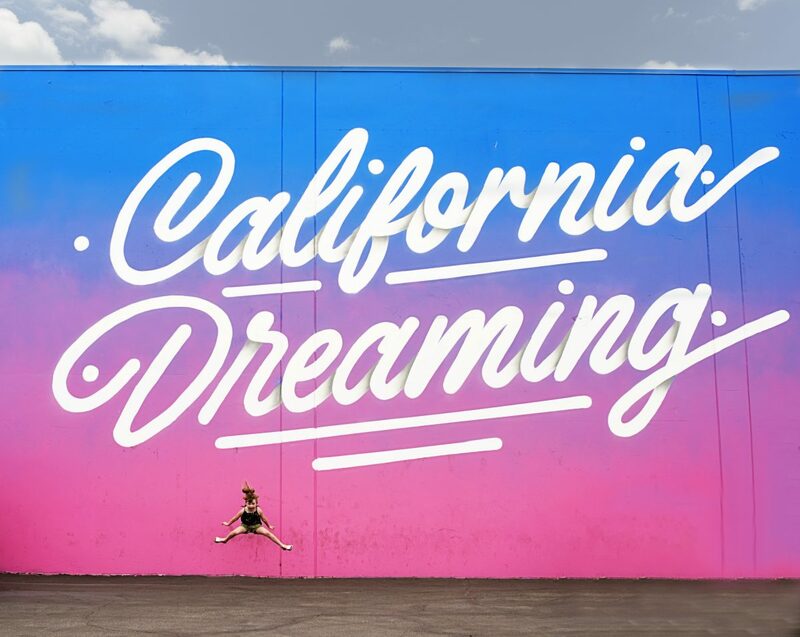 I am now California dreaming about your trip. You guys have visited all the stunning places at a time. I wish I could have done such a trip. Brilliant! Well done on the photo, they are great captures. As a mom, I think you are so great that you took your little children to many stunning places. From now on, I’ve made up my mind to do so. Thanks for sharing! Katie this post is just so beautiful it actually makes me want to cry a little!! I fondly remember seeing all of these places and I have so many amazing memories from them all but most were done without our little boys in tow, or when they were very young. I would love to take them back to do it all again with them, it’s such a special place. Beautiful!!! You take such amazing photos Katie – do you have any tips and tricks? I don’t suppose you have done a blog post about your photography skills?! I also love your writing style, so easy to read. 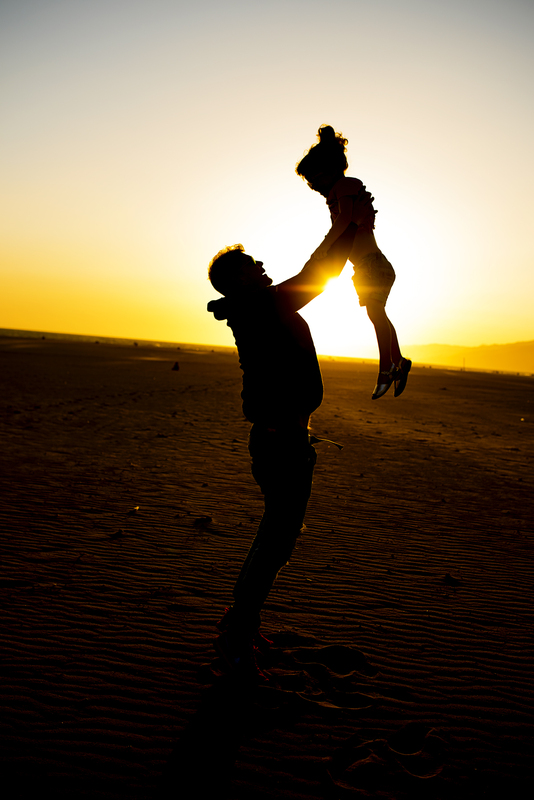 You make me want to do everything that you have done! Beautiful photos! Looks like so much fun! Very well documented travel. 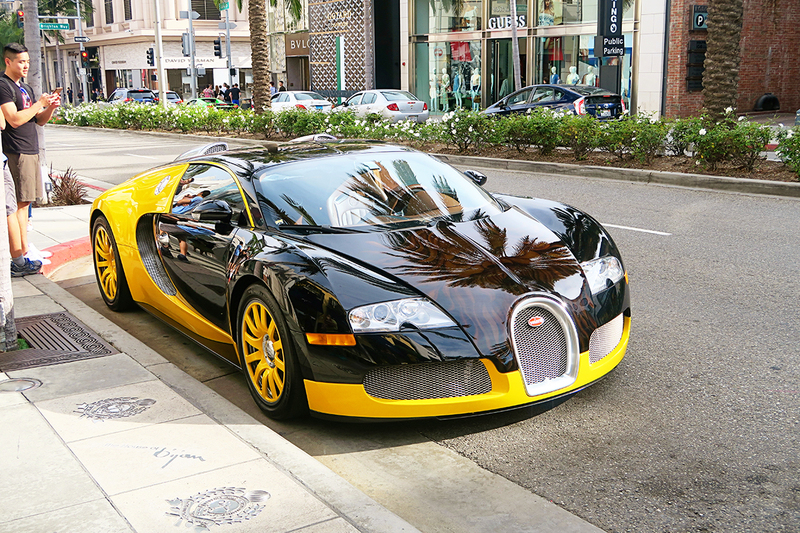 I’m a car guy, so that picture of the Veyron has me drooling. I always shy away from going to California, seems too expensive for my taste. Beautiful pictures, seems y’all had a wonderful time!